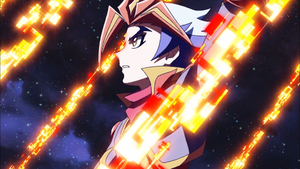 "Two Flames Unite" is the eighty-ninth episode of the Yu-Gi-Oh! VRAINS anime. It first aired in Japan on February 13, 2019. As his LP are lower than this opponent's, Soulburner activates "Salamangreat Performance", letting him target a Level 4 or lower "Salamangreat" monster in his GY and add a card with the same name from his Deck to his hand. He adds a copy of "Salamangreat Fowl". As he controls no monsters, Soulburner then activates the effect of the "Salamangreat Mole" in his GY, banishing it to return 5 "Salamangreat" cards from his GY to his Deck, then draw two cards. He returns "Fowl", "Performance", "Salamangreat Beat Bison" and "Salamangreat Roar" to his Deck and "Salamangreat Heatleo" to his Extra Deck and draws 2 cards. As he controls no monsters, Soulburner activates "Rising Fire", letting him Special Summon a FIRE monster from his GY and equip it with "Rising Fire", increasing its ATK by 500. He Special Summons "Heatleo" (2300 → 2800/↙↑↘). As Windy controls only 1 "Stormrider" Link Monster, the effect of "Stormrider Blast" negates the effects of all Link Monsters his opponent controls with an equal or lower Link Rating than the "Stormrider" he controls. In this case, the Link-3 "Stormridership Bahamut Bomber". The effects of "Heatleo" are negated. Soulburner equips "Bahamut Bomber" with "Salamangreat Sparks". Now, if it battles an opponent's monster, its ATK will become equal to the current ATK of the monster it's battling during damage calculation. Soulburner then equips "Heatleo" with "Salamangreat Claw", which will prevent the equipped monster from being destroyed by battle or card effects and allow it to inflict piercing battle damage. As he controls no cards in his Spell & Trap Zone, Windy activates the effect of "Bahamut Bomber", destroying a card Soulburner controls and inflicting 500 damage. He destroys "Claw" (Soulburner: 600 → 100). Soulburner Normal Summons "Salamangreat Falco" (1200/1600). As a "Salamangreat" monster besides "Fowl" was Normal or Special Summoned, Soulburner activates the effect of the "Fowl" in his hand, Special Summoning it (1800/200) in Attack Position. Soulburner sets "Falco" in the Link Arrow to Link Summon "Salamangreat Balelynx" (500/↓) to the Extra Monster Zone. "Stormrider Blast" negates its effects. As "Falco" was sent to the GY, its effect activates, letting Soulburner Set a "Salamangreat" Spell/Trap Card from his GY. He Sets "Claw". Soulburner sets "Balelynx" and "Fowl" in the Link Arrows to Link Summon "Salamangreat Sunlight Wolf" (1800/↑↓). Its effects are negated by "Blast". Soulburner activates the effect of "Salamangreat Sanctuary" to set "Heatleo" in the Link Arrows to Reincarnation Link Summon another copy of "Heatleo" (2300/↙↑↘). Soulburner equips his Set "Claw" to "Heatleo". When "Claw" is equipped to a Reincarnation Link Summoned monster, it can attack a number of times equal to its Link Rating. "Healeo" attacks "Bahamut Bomber", with the effect of the equipped "Sparks" making the ATK of "Bahamut Bomber" equal to that of the monster it is battling (2800 → 2300). The effect of "Claw" prevents the destruction of "Heatleo" by battle, so only "Bahamut Bomber" is destroyed. As "Sparks" was sent to the Graveyard, its effect activates, letting Soulburner Special Summon two "Salamangreat Tokens" to either side of the field. He Special Summons them to Windy's field (0/0 each). "Heatleo" attacks and destroys a "Salamangreat Token", with "Claw" inflicting piercing battle damage (Windy: 4000 → 1700). "Heatleo" attacks a "Salamangreat Token", but Windy activates the effect of the "Stormrider Gulldiver" in his hand, sending it to the GY to halve the battle damage and end the Battle Phase. The "Token" is destroyed (Windy: 1700 → 550). As the effect of "Gulldiver" was used this turn, Windy activates its other effect, banishing it from his GY to Special Summon a "Stormrider" Link Monster from his GY with a Link Rating less than or equal to the number of monsters destroyed by battle this turn (in this case, 3), but its ATK is halved and its effects are negated. He Special Summons "Bahamut Bomber" (2800 → 1400/↙↓↘). The effect of "Blast" increases the ATK of all "Stormrider" Link Monsters by 400, plus another 300 for each "Stormrider" Field Spell Card in the GY ("Bahamut Bomber": 1400 → 2100). Soulburner activates "Salamangreat Sublimation", Tributing a "Salamangreat" monster to gain LP equal to its ATK and draw a card. He Tributes "Sunlight Wolf" (Soulburner: 100 → 1900). Soulburner Sets the card he just drew. During the Standby Phase, "Stormridership Stolastorm" returns to the field (1500 → 2200/↓). As he has 1000 or fewer LP, Windy activates his Skill, Storm Access, letting him add a random Link Monster in the Data Storm to his Extra Deck. He adds "Stormriderflagship Bahamut Bomber Custom". Windy sets "Stolastorm" and "Bahamut Bomber" in the Link Arrows to Link Summon "Stormriderflagship Bahamut Bomber Custom" (3000 → 3700/←↙↘→). As he controls no cards in his Spell & Trap Card Zone, Windy activates the effect of "Bahamut Bomber Custom", letting him treat one of Soulburner's monsters as a Continuous Spell Card. "Heatleo" is moved to the Spell & Trap Card Zone. As he controls no cards in his Spell & Trap Card Zone, Windy activates the other effect of "Custom", destroying as many cards in his opponent's Spell & Trap Card Zone as possible and inflicting 500 damage per card. This effect cannot be responded to. "Heatleo" and Soulburner's Set card are destroyed (Soulburner: 1900 → 900). "Custom" attacks directly, but Soulburner activates the effect of the "Salamangreat Ascetic" in his GY, banishing it to target a "Salamangreat" Link Monster and a non-Link "Salamangreat" monster in his Graveyard, returning the Link Monster to his Extra Deck and Special Summoning the other monster in Defense Position with its effects negated. He returns "Sunlight Wolf" to the Extra Deck and Special Summons "Falco" (1200/1600). A replay occurs and "Custom" attacks "Falco". Soulburner activates the effect of the "Balelynx" in his GY, banishing it to prevent the destruction of his "Salamangreat" monster by battle. Soulburner draws and Normal Summons "Salamangreat Gazelle" (1500/1000). As it was Normal Summoned, its effect activates, letting Soulburner send a "Salamangreat" monster besides "Gazelle" from his Deck to his GY. He sends "Salamangreat Spinny". As he controls a "Salamangreat" monster besides "Spinny" and "Spinny" is in his GY, Soulburner activates the effect of "Spinny", Special Summoning it (1000/1500) in Defense Position. Soulburner overlays his two Level 3 monsters to Xyz Summon "Salamangreat Miragestallio" (2000/900) in Attack Position. Soulburner activates the effect of "Miragestallio", detaching an Overlay Unit to Special Summon a "Salamangreat" monster from his Deck in Defense Position, but this will prevent him from activating monster effects of non-FIRE monsters for the rest of the turn. He Special Summons "Beat Bison" (2800/1000). He activates the effect of "Beat Bison", letting him target FIRE Link Monsters in his GY up to the number of face-up cards his opponent controls and return them to the Extra Deck, then he can negate the effects of cards his opponent controls up to the number of cards returned. He returns two copies of "Heatleo" to to negate the effects of "Custom" and "Blast" ("Custom": 3700 → 3000). Soulburner sets "Miragestallio", "Spinny" and "Beat Bison" in the Link Arrows to Link Summon "Heatleo" (2300/↙↑↘). As "Miragestalio" was used as Link Material for a "Salamangreat" monster, its effect activates, letting Soulburner return a monster on the field to the hand. He targets "Custom", but Windy activates the effect of the "Stormrider Tubieloof" in his hand, sending it to the GY to negate a monster effect. Soulburner activates the effect of "Sanctuary", setting "Heatleo" in the Link Arrows to Reincarnation Link Summon another copy of "Heatleo" (2300/↙↑↘). As it was Reincarnation Link Summoned, its effect activates, letting Soulburner target a monster his opponent controls and change its ATK to that of a monster in his GY. He targets "Custom" and "Spinny" ("Custom" 3000 → 1000). "Heatleo" attacks and destroys "Custom" (Windy: 550 → 0). #049 "Duelist Clad in Flames"
#050 "Transfer Student Takeru Homura"
#051 "Man Who Gave Up Charisma"
#052 "Hero in Name Only"
#053 "Bounty Hunter Blood Shepherd"
#055 "To the Unknown World"
#056 "Blue Girl's First Battle!" #057 "Final Battle Above the Clouds"
#060 "Brave Max the Loser"
#069 "Mission That Must Be Accomplished"
#073 "Light Blade that Slices Despair"
#075 "The Demon Possessing His Heart"
#079 "Speed of Light - Lightning"
#081 "Arrived at the Summit"
#084 "Past That Cannot Be Quieted"
#086 "Wisdom of the Deprived"
#090 "Creator of the Next Generation"
#093 "Promise With Each Other"
#095 "Radiance of the Phoenix"
#098 "The AI Crosses the Line"
#099 "Door to the New World"
This page was last edited on 14 March 2019, at 11:35.